Gerson clicker press is one of hydraulic cutting machine.which is used small cutting dies to cut soft and semi-rigid material.the clicker press with swing arm or beam ,so we also called hydraulic swing arm clicker press or hydraulic swing beam clicker press. 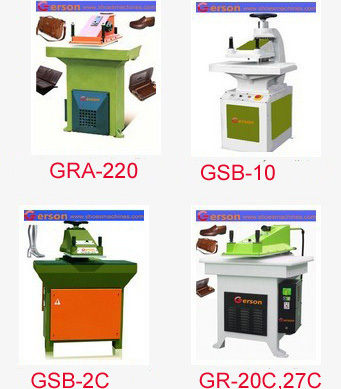 The first hydraulic clicker press used in shoes industry ,then used to other industries ,such as bag,garment etc.,Now more and more factories used hydraulic clicker press for their production. 1. safe and simple to operate with the operator having only to place the material on the bed of the press, position the cutting tool on the material and press the twin, operating buttons. 2.The swing beam descends under hydraulic power to cut the required cut shape from single or multiple layers of sheet material. 3.Easy to operate with swing arm and button press. 4.Economic cost and stable working function.